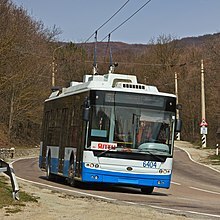 ^ 1.0 1.1 1.2 The longest trolleybus line in the world!. blacksea-crimea.com. [2007-01-15]. ^ Makewell, Roy. "Trolleybuses Over the Yaila Mountains". Trolleybus Magazine No. 193 (1994年1月-2月), pp. 2–16. National Trolleybus Assn. (UK).